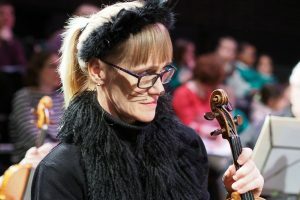 YPCF has created another new programme of workshops and concerts for Year 1 and Year 2 children which continues in 2018. 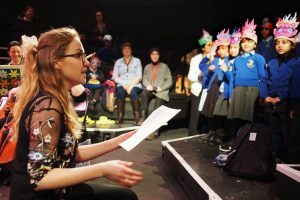 The youngest children the Foundation has worked with (aged 6) create their own versions of Peter and the Wolf with narrator Michael Jenn and their own songs for Peer Gynt in workshops led by animateur Becky Chalmers. Also featuring Marina Solarek (violin/leader) and John Rockliffe (percussion) workshops inspire new songwriting and instrumental work in schools, children create Ocean Drums with teachers, collaborate on mask-making and create action games and songs that are performed with YPCF full orchestra at The Cockpit, conducted by Becky Chalmers.